I’ve never considered myself a “runner.” Cardio for fun? It was a no. Getting sweaty, out of breath, and red-faced for no good reason just wasn’t appealing to me. After coming to college, however, I wanted to find a way to stay in shape amidst a sea of midterms and easily accessible junk food. 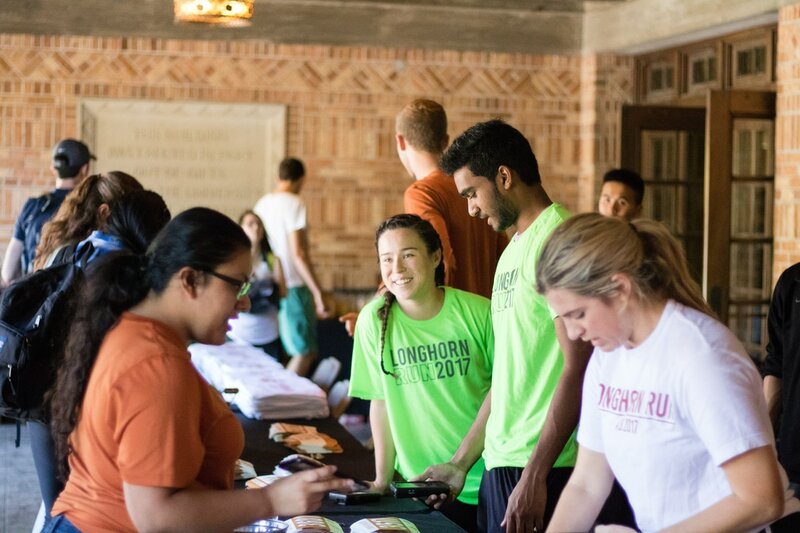 I joined Longhorn Run because I saw what an impact it made on the UT community and how many diverse groups took part in it, and since joining, I’ve met so many inspiringly fit people—people who have run Spartan races, triathlons, and even marathons. Hearing about their accomplishments motivated me to give running a second try. It hadn’t been my favorite thing in the past, but who knew, maybe I’d find my second wind. The first week was definitely the hardest. I’d decided to try and follow the 10K Finish The Race training plan, and to be honest, I could barely run a mile. I was panting and ready to give up after the first few days, but I stuck with the commitment I’d made—and guess who can run 3 miles now? (It’s me!) Sure, it isn’t record breaking or anything, and it’s at an 11-minute pace, but it’s the longest distance I’ve ever run in my life, and I’m proud of that. It’s been a little over a month, and I’m still trying to keep up with the training plan. It’s so satisfying to cross those workouts off the calendar. Sometimes I have to shuffle around which days I run compared to the calendar, but keeping the distance consistent with a physical plan has really helped me to commit to running. I still can’t say running is my favorite thing in the world, but I feel so accomplished when I hit my distance goal. Every run gets easier now, and I’m enjoying it more and more as I switch up the music I listen to and where I run. I’m so happy that Longhorn Run has given me this inspiration, and I can’t wait to see everyone reach their goal when the cross the finish line on race day! I’ll see you all there! I fell in love with Longhorn Run the first time I ran it in 2016. Not completely knowing what I was getting myself into, I signed up the week of the race and showed up to the start line that Saturday morning, underestimating the race and very much only expecting to get a free banana out of it. As the number of participants grew, I was shocked at the extent of familiar faces I saw; my classmates, professors, former lab partners, and friends from every nook and cranny of my on-campus life were there -- all with a shared goal. 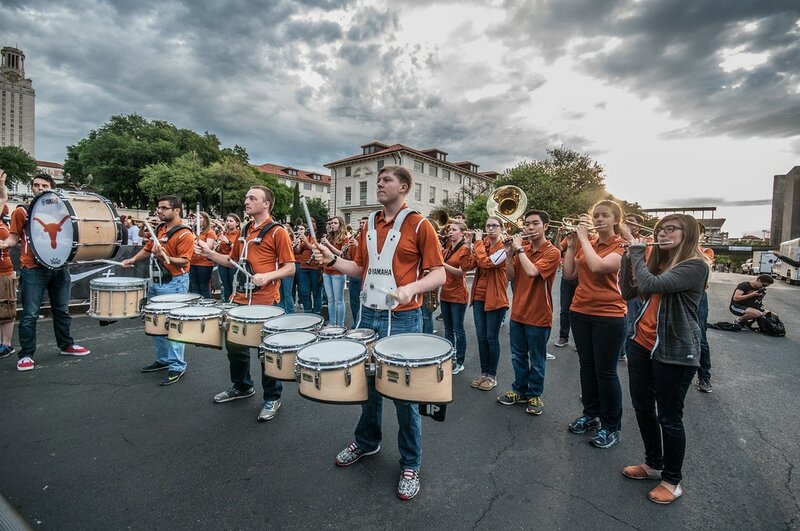 The race began, and the UT spirit was tangible from the start. Everywhere I turned, my peers from all different aspects of the UT community were cheering each other on to keep going and to be their best self. As I winded through different areas of campus, I saw my UT home illuminated by incredible people overwhelmed with UT pride. As a runner, I’ve ran many organized races, most of them larger than Longhorn Run, and there is still no comparison to the feeling I experienced on the Longhorn Run course. ​Longhorn Run brings together every possible niche of the 40 acres and unites us all under the same motivation – to have fun, to achieve goals, and to celebrate the incredible school we are all so lucky to go to. 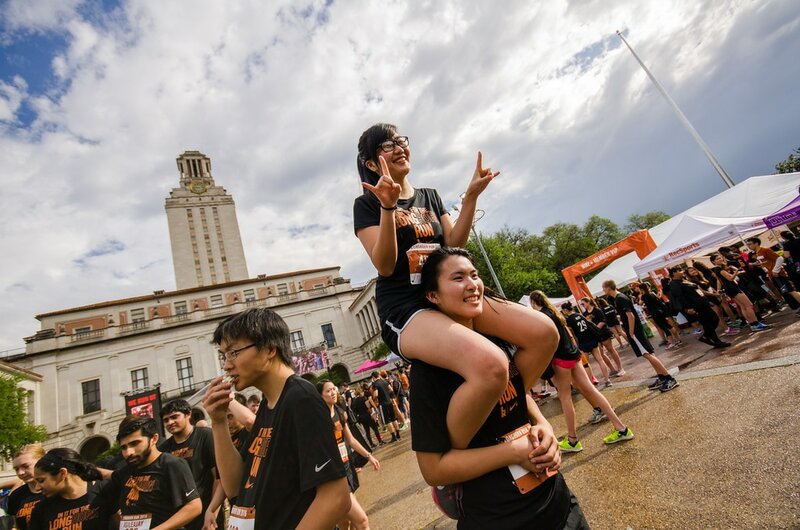 As the On-Course Coordinator for Longhorn Run 2018, it is my privilege to give that feeling of accomplishment, excitement, and pride that I felt after my first Longhorn Run back to the 5,000+ runners who will take on Race Day in April. I am ecstatic to use my position on Longhorn Run Committee to give back to the school and the community that have given so much to me over the past four years. Join me on course this year to see what awesome things my team has been working on for the past few months and to celebrate the absolutely incredible community we are a part of! What is the LHR Training Program and How Will It Help Me? The Longhorn Run Training Program is a free 10-week-long running program, designed to help you “Finish the Race” or “Finish Fast”. So whether you’re just starting to run or aiming to make this your fastest time, Coach Anthony Ferraro’s plans are here to help you achieve your goals. Longhorn Run’s running coach, Anthony Ferraro, is certified by the American College of Sports Medicine, Nike, USA Track and Field, and the RRCA. He currently serves as the Strength and Conditioning Coach for Rogue Athletic Club, an Olympic development team in Austin, and has cared for athletes that participated in the 2016 Olympic Games and the 2016 British Steeplechase Championship. You can always follow your own training plan for race day, but here are some of the perks of joining LHR in the training journey. A Community of Support - We’re all rooting for you! We have a passion to see you succeed as much as you want it. By participating in the LHR Training Program you’re gaining a community of fellow Longhorns who also strive to accomplish their goals. Holds You More Accountable - By coming to the future Training Events and keeping up with the program, your fellow Longhorns will hold you accountable to what you commit to. This is great to ensure you’re staying on track and don’t get carried away along the journey. Plans Your Success - Coach Anthony has taken care of the hardest part. He’s strategically created a program that will ensure your body has a balance between rest and challenge so you’ll run UT like a champ! Pushes You Further - Training on your own can be very effective, but having Coach Anthony guide you through the journey ensures you’re completing the distance necessary to achieve your goal all while doing so safely. Pushing yourself through the training program will be the best challenge you decide to take on! Download the digital version of the training program straight to Google Calendar, your favorite calendar app, or print the PDF version. Follow us on social to get updates about upcoming Training Events to accompany your training journey! And don’t forget to share your training journey along the way with #WeRunUT. You’re not the only one who struggles with trying to balance health and happiness over the winter break! There’s a change in your daily routine and sweet treats everywhere. It’s truly the happiest time of year, but that doesn’t mean your healthy lifestyle has to suffer. ​We understand this month away from school may include the challenge to reach your daily step count or hold back on the cookies. So we asked some of our Longhorn Run Committee members what their guilty pleasures were and how they try to stay active over break. Feel free to take some of these ideas or begin thinking about how you’ll strike a balance! ​What is your biggest guilty pleasure over Winter Break? My grandmas apple pie is something I always look forward to. She makes one specifically for me and take it home to eat it all by myself. My grandma’s pound cake; it’s super good! Eating a looot of candy! Peppermint bark; I just can't get enough! I love to watch a bunch of TV shows and movies. I recently started Stranger Things! How do you stay healthy over Winter Break? I love getting together with my friends to play basketball, because it’s always good to catch up with them and shoot hoops. I love to take my family dog for walks since I don’t see her very often during the semester. My best friend and I go to the gym together and do these dance fitness classes and the music gets really poppin’. By skiing just about every day! I work at a yoga studio, so I want to keep going to classes. I have a puppy named Benji, he’s honestly a lunatic. (follow him @pupnamedbenji) So I plan on going to the park, and just try to keep up with him. It’s almost race day Longhorns! We are so excited to see you all at the starting line this Saturday, April 8th. For new and experienced runners alike, it is always helpful to know exactly what to expect on race day so you can fully focus on accomplishing your goals. This blog post will hopefully help calm some pre-race nerves and answer your race day questions! How should I prepare the night before? ​If this is your first race, there’s a few general tips you should know for night before race day preparation. First, it’s smart to do as much as you can to get ready the night before including setting out everything you’ll need (running outfit, race number, safety pins, ear-phones, etc.) You’ll also want to charge your running watch if you’re planning on wearing one. It’s never fun forgetting something you want on race day or not being able to find your lucky pair of running socks. It can also help to plan out transportation, parking, and carpooling the night before. Finally, get good sleep, drink a lot of water and electrolytes, and don’t forget to set your alarm! The 10K race is set to begin at 8:00AM followed by the 5K at 8:15AM. Runners must arrive to the starting corral at least 15 minutes prior to the start of the race. Runner’s Tip: It’s always a good idea to wake up an hour before your race to get something in your stomach and make sure you’re fully awake. Get to the starting line as early as you feel comfortable so you can loosen up and stretch. However, don’t head there too early - the nervous energy of standing in the corral can take a toll on your energy levels for your race! Where does the race start and end? The race starts just west of 21st. Street and Speedway at The University of Texas at Austin. The race ends at the same location followed by a post-race celebration at the steps of the UT Tower. Runner’s Tip: Don’t sell yourself short when finding a place in the corral. Many runners make the mistake of finding a spot further back than they should be. Be confident in yourself and your training and realistically put yourself in the best position to reach your goals. Where can I find information about traffic and closures for race weekend? All the latest information on traffic and closures can be found here. Runner’s Tip: Have a parking plan before you go to bed the night before the race so you aren’t trying to figure it out in the morning. Leave a little earlier if you are nervous about parking and traffic. It’s better to calm your nerves and be a few minutes early than show up stressed to the start line. Carpooling is also a good idea! Here are the self-pay parking garages closest to the start/finish line. Please note that other parking locations may be affected by street closures in the campus area. We also encourage you to use ridesharing services in the area to avoid the stress of parking on race day morning. ​Who do I contact if I have any other questions? Is there race day packet pickup? We offer race day packet pick up for runners traveling from out of town on race day morning from 6:30-7:30am. The packet pick-up tent will close promptly at 7:30am so plan ahead! Runner’s Tip: Get your packet if you can BEFORE race day! Avoid this added stress the morning of your race by stopping by Gregory Gym for Packet Pick-Up. Will there be bag check at the race? 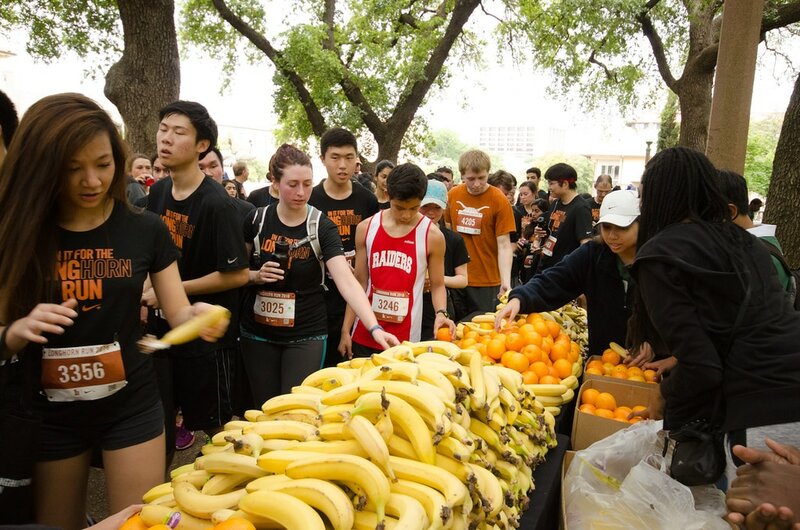 The Longhorn Run does not offer bag check at the race. Please only bring items that you can run with. Runner’s Tip: If you have any friends or family coming to cheer you on, you may want to ask if they’ll bring you something dry to change into for the post-race celebration. How do I find out about race changes or updates due to inclement weather? Our team will post any updates or changes on the race website homepage and social media channels (@LonghornRun). Will there be pace groups? Yes! Trained pacers from UT’s Texas Running Club and Texas Triathlon Club will be your pacers on race day to keep you motivated and on track through the finish line. We will offer the following pace groups for both the 5K and 10K: 7:00, 7:30, 8:00, 8:30, 9:00, 9:30, 10:00, 10:30, 11:00, 11:30, 12:00. Runner’s Tip: Pace groups can be really helpful for achieving time-based goals. Especially if this is your first race, consider at least starting with a pace group that corresponds with your training and fitness level. While pace groups can be beneficial to some runners, they aren’t for everybody so don’t worry if you find that you like setting your own pace and running alone. 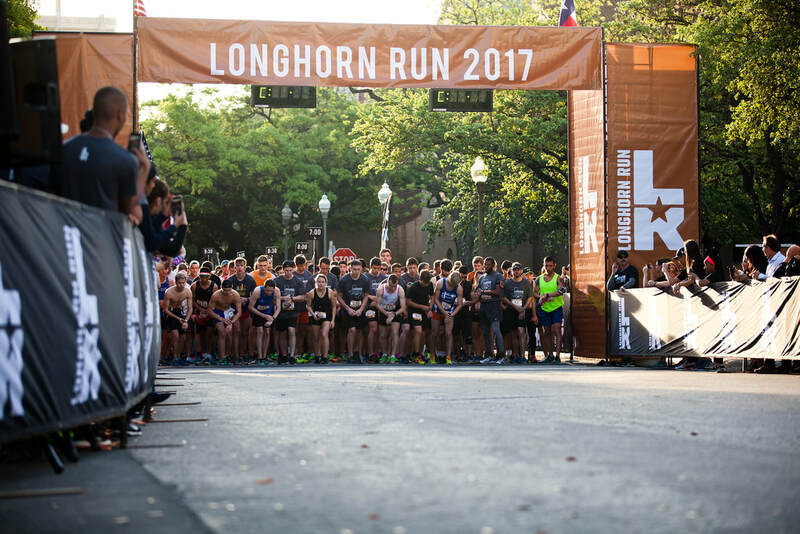 Wear your Longhorn Run 2017 participant tee, your favorite athletic bottoms and running shoes. What can I expect after the race? Beyond the Finish Line: Get Pumped About the Post-Race Lineup! After crossing the finish line, join us for post-race and let’s celebrate our accomplishments together at Main Mall! ​This year, we’ve introduced a COOLDOWN ZONE featuring St. David’s Health Care, The University of Texas Dell Medical School, Instructor-Led Yoga for Runners, Foam Rolling Demos by RecSports Personal Trainers to help you recover properly after crushing those Ks. Additionally, post-race will feature DJ Mel, with two emcees: Nike Master Trainer and UT Alumna Flor Beckmann, and Nike Trainer and former UT Football Player Martin Egwuagu. One last thing for that killer photo opp: if you run with the Nike+ Running App during the race, earn access to the Nike+ Finisher’s Photo Experience at Main Mall. Post-race promises to be a great experience. Be sure you’re registered and all prepped for race day here. See you Saturday!